Snowy Owls, Egrets and Unexpected Graces is a portal to an interior landscape that mirrors the natural world – the majesty of western red cedar and snowy owls, the murmurations of songbirds and the incantations of astral showers. The poet simultaneously reflects on the suffering of those living with cancer and chronic illness as well as the on-going habitat destruction amidst climate change, and the violence of war and poverty. This book invokes hope and gratitude in the midst of sorrow and grief, an invitation to take a breath in the midst of the turning of the wheel of the year, to pause and recalibrate to the music of the cosmos. “Gwendolyn talks to birds. They talk back. The birds write. Calligraphy tracks on the sand. Gwendolyn takes care of her people. The fog settles into the chest cavities of those around us. Gwendolyn reads the mystics. Cares for the sick. Spend some time with her. GWENDOLYN MORGAN learned the names of birds and wildflowers and inherited paint brushes and boxes from her grandmothers. With an M.F.A. in Creative Writing from Goddard College, and an M.Div. from San Francisco Theological Seminary and the Graduate Theological Union, she has been a recipient of artist and writing residencies at Artsmith, Caldera, Into the Depths of Winter, and Soapstone. Crow Feathers, Red Ochre, Green Tea, her first book of poems, was a winner of the Wild Earth Poetry Prize, Hiraeth Press. 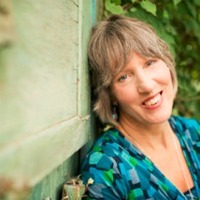 Her poems have appeared in: Calyx, Dakotah, Kalliope, Kinesis, Mudfish, Tributaries: A Journal of Nature Writing, Written River as well as The Cancer Poetry Project 2, and other anthologies, blogs and literary journals. 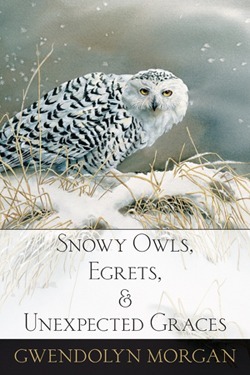 Snowy Owls, Egrets and Unexpected Graces is a Nautilus Gold Winner in Poetry and a Foreward Indies Book of the Year Finalist in the Nature Category. Gwendolyn and Judy A. Rose, her spouse, share their Salmon Creek home and creekside walks with Naomi, a rescued Cardigan Corgi & Chesapeake Retriever mix.